Well, it's been difficult to do any daily paintings with the holidays on the way! I paint pet portraits and home portraits as well and it seems like everyone wants one for Christmas this year. So I'm totally busy trying to get them all done in time! 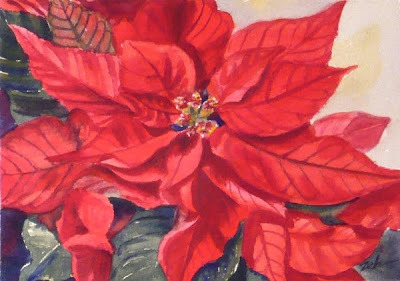 But the red poinsettias in my studio are so colorful and pretty, they just begged to have a painting done of one of them. It is always interesting to paint a plant or flower as one really has to study it and learn how it is composed. The most attractive part of this plant is not the flower itself but the colorful red leaf bracts. This painting has been sold. See more of my work for sale in Janet Zeh Etsy shop. Thanks for stopping by and have a lovely day!